I always thought of pre-testing as something you do before working on a unit of content, later followed up with a post-test. Comparing pre-test results with post-test results can then be used as part of the course assessment to find out what, if any, learning has happened. But that's no longer my first thought when I hear the term "pre-test." Several years ago, I ran across a news item that referred to a piece of learning science research that described another use for pre-testing. It showed that students who took a pre-test did better than students who did not take a pre-test. It showed, I think, that just the process of pre-testing primes student learning in a way that has a demonstrable and significant effect on student success. As with any new way of doing things that I discover, I had to let it percolate in the back of mind for a while. First, do I really believe it? Further research showed me that this was not a one-off experiment—it's been tested in both the lab and in the field with similar outcomes. Next, will it work in my courses? If so, how would I implement it? And the all-important question: would I have time to implement it? Would it then add extra effort and time to my workload every semester, in perpetuity? Well, I finally jumped in and tried it. I figured it could do no harm. And I found a way to do it without much effort—either in initially wedging it into my course or in maintaining it across all future courses. I'd already been using frequent online tests, each allowing multiple attempts, as a way for my students to prepare for their written exams. Each online test has a test bank of many more items than appear on any one attempt. Each test item is pulled from a group of items relating to the same learning outcome, so tests end up being different in every attempt. By using just a handful of items in each group, the odds quickly become astronomical that a student will get the same test twice—or get the same test as any other student in the course. Sort of like the classic type of slot machine. My existing online tests were already cumulative. They included test item groups from previous tests, so that students have continuing practice with concepts introduced throughout the course, as explained in my recent article, Cumulative Testing Enhances Learning. What I did to make the pretests is simply go into my online test editor (Respondus) and make a copy of each online test. Then I removed the cumulative item groups from each test, leaving only the item groups that pertain to that particular unit of study. An easy and quick job in the test editor. Then I saved those as pre-tests and uploaded them to my learning management system (LMS). And set them up for ONE attempt only (not the usual three possible attempts). What?! Using the same test items as their "real" test? Isn't that just like handing them a list of answers? Glad you asked! Remember, the odds of anyone ever getting "the same test" again (or as anyone else gets) is astronomically low. What they get in the pre-test is a "version" of the real test, but not the actual test that individual will end up taking later. I then set up my LMS so that each pre-test opens about halfway through the preceding unit. Students can go into the LMS before their next unit to take the pre-test for the upcoming unit. I also set things up so that students do not have access to the course resources they need to get through the unit until after they submit the pre-test. For example, I use online Previews as part of my sorta-flipped format (I called it a half-flip with a quarter turn). If they don't take the pre-test first, then neither the Previews, nor anything else, will open up for them. Because the "locks" that unlock the other course resources give students incentive to do the pretests, I didn't need to assign grade points or deduct grade points if they didn't do it. My pre-tests do not impact the grade directly—only indirectly by enhancing student learning. I have been amazed at the results of that simple step. I noticed that class performance increased right away—and there has been no downward trend since then. So I guess I shoulda believed the research data when I first saw it, eh? I think there are several things going on. For one, pre-tests give students an overview of what they'll be expected to solve at the end of the unit. And they'll get a chance to use what they know already to predict what might be a correct answer—with immediate feedback on where they predicted incorrectly. This prediction exercise can be a powerful learning strategy. Also, as they then struggle through the unit, they have in mind what they need to master if they're going to have a chance of passing the test. Along the same lines, they gain some familiarity with the upcoming material. They'll have "seen this all before" even if they don't fully understand it. As we go through it all after the pre-test, students will have already walked through that neighborhood, so it's not so unfamiliar to them. I think pre-testing also shakes loose some prior learning. That is, students will recognize some basic principles and some patterns that they've seen before. I suggest that this stimulates their awareness of how things connect and thus gets them better prepared for their new learning. One last thing I want to mention: I now have another assessment tool that I can use to compare before-after data and get a sense of what my students have accomplished. Even better, I suppose, is that I added a column to their LMS gradebook that calculates their "gain" by providing the percentage by which they improved between the pre-test and the real test (post test). Individuals seeing that they learned a lot in each unit is a real motivator for continued hard work in the course. As with anything, there are potential pitfalls. The one that I didn't anticipate, but should have, is that the super-high-achievers will NOT want a "bad grade" anywhere in their gradebook. Even though students are EXPECTED TO FAIL the pre-test—and it isn't part of the course grade calculation. It's a mindset—it doesn't have to make sense. So I would have these high-achievers in my office the day after they took their pre-test and want me to go over every item with them. I'll bet their blood pressure wasn't normal that day, either—probably even worse the night before. The solution I found, which is not 100% effective, is to repeatedly remind students that they are expected to do poorly on the pre-tests. And that they should not struggle with it—just think a moment, then give your best guess and move on. Like any unfamiliar teaching strategy, pre-testing works best if you tell students how they will benefit. If any of you have experiences with pre-testing that you'd like to share, please comment at the blog site, in the form below this article. Kevin Patton. The A&P Professor. Collection (various dates). An assortment of brief articles on methods and issues regarding testing in the undergraduate A&P course. Kevin Patton. The A&P Professor. 5 Sep 2016. Article on how cumulative testing can be used to promote long-term learning in A&P courses. The pretesting effect: Do unsuccessful retrieval attempts enhance learning? Richland, Lindsey E.; Kornell, Nate; Kao, Liche Sean. Journal of Experimental Psychology: Applied, Vol 15(3), Sep 2009, 243-257. Research article describing experiments in pre-testing. James M. Lang. Jossey-Bass, San Francisco. 2016. If you don't read anything else on teaching-learning this year, at least read this. Lang's clear writing, chunked into small chapters, reviews some of the major contemporary insights with practical "small" things you can do in your class to improve learning. Part I, Chapter 2, discusses pretesting. It's true. Like most of you, I have a long list of tasks that need to be done in any one day or week. I am pretty good about remembering what I have to get done by when, what I've already finished, and what has just been added to my plate. But my brain is not 100% reliable with that, so I make lists. Sometimes these are lists on my computer desktop or in my online Task List. But those are too easily hidden. I have to see them to be reminded. So I often make paper lists. There is something very satisfying about having the kinesthetic experience of physically ticking something off my list with my trusty green pen. I was talking about this last summer when I was presenting a bunch of practical tips to help textbook authors stay on track at the Textbook and Academic Authors conference. During the talk, my buddy Mike Kennamer tweeted, "'Checkmarks make me happy...' Kevin Patton". When I saw that tweet later in my Twitter feed, I chuckled that he took this out of the discussion—but I also realized how important a point that it is. Whether it's a textbook revision or a long semester of teaching A&P, those little surges of dopamine that happen when we can check something off our lists really do help keep us motivated. Seeing the progress we are making as we add ticks to our checklists provides some additional satisfaction, which also helps keep us going. And checklists also keep us from forgetting important things to do. In an online course I teach, it's easy to forget what needs to be graded each week because there are no stacks of tests or papers sitting there on my desk glaring at me. Those assignments are hidden away on a server somewhere and I need to intentionally call them up to grade them. So I need a checklist. the one pictured here lists grading duties organized by module (we have two-week modules A, B, C,...) and by week. Each Friday, during my scheduled grading session, I look at my checklist. I note that, even though it may not always feel like it, the trimester is actually progressing. And I see what I need to grade this week. And—hooray!—I get to check it off my list when I'm done. What a great way to start the weekend, eh? I recently posted my grading checklist in that online course. It's a bit late for this last term, but next time I teach the course, my students can print out my checklist to help them keep track of what they've submitted each week. Sure, they have a syllabus. Like they're going to use that to make their own list? Really? What planet do you live on? 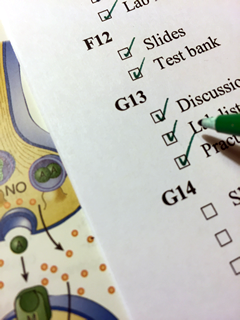 Grading checklists help us make sure that no graded assignments fall through the cracks. Grading checklists provide happiness and motivation. At least a little. Scheduled grading sessions help us keep up with our grading tasks, preventing them from piling up and disturbing our mental health. We can share grading checklists (and an exhortation to use them) with students to help keep them on track—and stay motivated.